When the winter approaches, it is wise to take measures to protect your trees against the elements to ensure they will be healthy for years to come. Contact the tree care professionals at Greenbloom Landscape Design to get your trees and garden prepared for winter. Covering your tree in a protective material to guard against potentially harmful conditions such as harsh winds or snow. 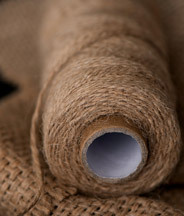 Burlap is a heavy, coarse plain-woven material made from jute or hemp. How Do You Wrap with Burlap? Attach the burlap to the top of the central branch of the tree with a clothespin. Begin wrapping the burlap around the tree towards the ground, going around the trunk and lower branches. Go back up the tree, overlapping the burlap slightly, and finish where you began. Cut the burlap from the bolt and attach the end to the starting branch with a clothespin. Tie three pieces of twine around the tree at the top, middle, and bottom and remove the clothespins when the twine is secure. An alternate method is to place wooden stakes into the ground around the tree or hedge. Secure the burlap to one of the stakes then wrap the fabric around the outside of the stakes effectively making a “room” with the trees on the inside, leaving the top open. This is a good method for trees and shrubs needing protection from the winter winds such as Japanese Maples. When Do You Remove the Burlap? Early April, once the snowfall risk is gone. A damaging condition that occurs in the winter from a combination of harsh sunlight and lowered moisture levels in the soil. Why Should You Wrap with Burlap? Burlap is effective at blocking the sunlight that can cause brown spots on your trees and damage to the bark. It is especially useful for young, weak, or hard pruned trees. 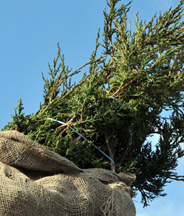 What Are the Benefits of Wrapping Trees with Burlap? Burlap protects the trees from heavy snowfall, damaging winds and ice which can break branches, animals that may try to eat the buds, leaves or bark, and guards the leaves and bark against bright winter sunlight. Plastic can cause the tree to warm up too much on a sunny day, acting like a greenhouse and stimulating growth. When it cools down again, this growth dies. The heat can also scald the tree and damage the bark. Burlap lets the tree breathe, allowing access to moisture and light while maintaining a cool temperature.